IN the midst of Irish controversy over Minister John Gormley’s desire to ban stag hunting an unusual subject is due for auction in the Althorp Attic sale at Christie’s in South Kensington on July 7-8 next. Lot 175, an oil on canvas by Michael Angelo Hayes R.H.A. (1820-1877) depicts John Poyntz, 5th Earl Spencer (1835-1910) with the Ward Union Hunt in 1877. The ‘Red Earl’ served as Lord Lieutenant of Ireland twice during William Gladstone’s four administrations – 1868-1874 and 1882-1885. His first tenure there was relatively relaxed in comparison with his second – with the Spencers hosting and participating in much entertainment and sport. The Vice-regal lodge in Phoenix Park was home to Ireland’s Lords Lieutenant. 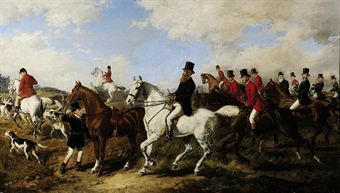 Michael Angelo Hayes (1820-1877), the Irish painter of military and sporting subjects, was born in Waterford and was the son of the portrait painter Edward Hayes. 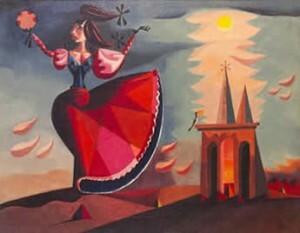 The painting is estimated at £15,000 – £25,000. The Ward Union is the only Stag hunt in Ireland and was founded in 1854. It takes its name from a hamlet and river called the Ward in Finglas and a roadside hotel at the time called The Union. Proceeds from the sales of contents from the attics, basements and stables of Althorp, ancestral home of the late Princess Diana, are destined to help pay for the current re-roofing and renovation project at Althorp Estate in Northamptonshire, England. * The Government narrowly won a Dáil vote banning stag hunting by 75-72 on June 29. UPDATED JUNE 29: THE James Adam country house auction on the premises at Fernhill, Sandyford, Dublin 18 on June 28 brought in 290,000 including fees, 240,000 without. The top lot was a portrait of a gentleman and a lady attributed to Mason Chamberlin (British, 1727-1787). It made 19,000. An oil on canvas by Nathanial Hone, Fishing Boats on the Lagoon, Venice, looking towards the Doges Palace on the right and Santa Maria della Salute on the left estimated at 5,000-7,000 made 9,000, an Irish George IV serving table made 5,700, a Victorian giltwood centre table sold for 5,600 and The Botanical Magazine or Flower Garden Displayed by William Curtis and continued by John Sims; col plates, Vols 1-24, 1787-1806 in twelve volumes made 5,500. The sale included a range of antiques, paintings, china, silver and antique linens together with items removed from Farmleigh House being sold on the instructions of the executors for the estate of The 3rd Earl of Iveagh. The auction was 85 per cent sold. Three hundred and seventy million. That is the total spent at art sales at Christie’s and Sotheby’s in London in June. The Christie’s Impressionist and Modern sale brought in 153 million on June 23. This is the highest total ever achieved at an art auction in London. It happened even though a Monet water-lily painting worth an estimated 30-40 million pounds failed to sell. Bidding on it reached 29 million pounds. Sotheby’s revised their figures upwards for the two-day sales series of Impressionist & Modern Art to 131 million pounds. The top lot at Christie’s was a Blue Period portrait by Picasso, which made 34.8 million pounds. European buyers accounted for 55 per cent of lots sold, 40 per cent of buyers were from the Americas and five per cent from Asia. Sotheby’s Contemporary Art Evening Auction in London on June 28 realised the solid total of £41,091,800 / €50,111,626, within pre-sale expectations of £38.3–52.8 million. It was the third highest total for a summer sale of Contemporary art at Sotheby’s London and a 60% increase on the equivalent sale last year. Nine works sold for over £1 million and 16 works for over $1 million. The top lot was Yves Klein’s RE 49, Relief Eponge Bleu. It made £6.2 million. Frank Auerbach’s Mornington Crescent – Summer Morning made £2.3 million and Bharti Kher’s sculpture The Skin Speaks a Language not its Own sold for £993,250, a new auction record for the artist by many multiples and a new record for any work by a contemporary female Indian artist at auction. The Post-War and Contemporary Evening Auction at Christie’s on June 30 made a total of £45,640,200, selling 84% by lot and 85% by value. The top price was paid for Silver Liz, 1963, by Andy Warhol (1928-1987), one of only two paintings of actress Elizabeth Taylor by the artist. It sold to an anonymous bidder for £6,762,150. A total of 58% of buyers were from Europe, 30% from the Americas with four per cent from Asia. What has become clear in this series of sales is that auction houses must get estimates right. If the estimate is too high the work will not sell. THE IRISH art market tends to track international trends. These now firmly dictate that the market at the top end has recovered from the biggest slump since 1991. The opening sale in the London series of June art auctions in London, Sotheby’s Impressionist and Modern Art sale on June 22, brought in a staggering €157,601,625 – an increase of 185% on the same series last year. For the second time in London auction history and the second time in six months three works made more than £10 million. * Henri Matisse’s Odalisques jouant aux dames brought £11,801,250. 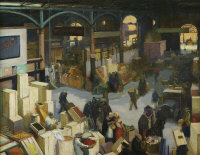 The 51 lot sale attracted buyers from no fewer than 13 countries; over 50% of the works sold achieved prices in excess of high estimate; and the average lot value for the works sold reached £3.2million. 19 works sold for more than £1 million and 29 for more than $1 million. 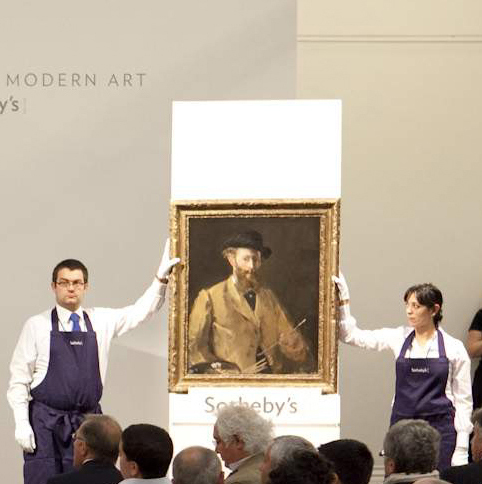 The total of Impressionist & Modern Art sold by Sotheby’s London in 2010 is an unprecedented £276 million. The Manet, one of only two self portraits he painted, was bought by New York dealer Franck Giraud. It had been part of the collection of New York collector and hedge fund manager Steven Cohen. The recovery in the market has encouraged collectors to sell high value works. Sellers now are confident. VENUS ITALICA from the workshop of Canova. The sculpture was located south of Tullamore. (click on image to enlarge). 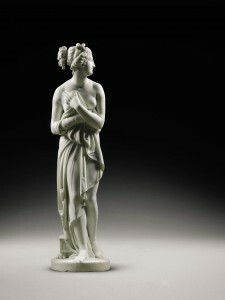 REDISCOVERED in Ireland and created in 19th century Rome three marble sculptures will feature at Sotheby’s sale of European Sculpture and Works of Art in London on July 8. The highlight of the group is an exceptional sculpture by the Northern artist Rudolf Schadow (German, 1786-1822) entitled Die Spinnerin, estimated at £120,000-180,000. Schadow had arrived in Rome in 1812 to fully absorb the legacy of sculpture from classical antiquity and work with the master Antonio Canova. The Cork trained sculptor John Hogan (1800-58) made a similar journey and lived in Rome for 24 years. Unlike Hogan, Schadow had a major patron in King Frederick William of Prussia who provided financial support. 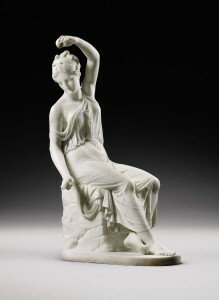 The sculpture of a young girl spinning was first conceived in 1816 and Schadow went on to produce versions for such eminent patrons as the Prussian King, Prince Nikolaus II Esterházy of Hungary, Prince Ludwig of Bavaria, Baron von Lebzelter, and the Duke of Devonshire. The Irish Grand tourist Henry Patten was one of many who followed the fashionable example set by the wealthy as they toured Europe, commissioning while on their travels works of art from artists residing abroad. Patten commissioned the present work in 1819 for his house in Westport, County Mayo and Schadow made several references to it during the spring of that year. There is a dedication to Patten on the marble. Die Spinnerin by Rudolf Schadow and Venus Italica and Hebe from the Workshop of Antonio Canova (1757-1822) were found in Annaghmore House, Tullamore, Offaly. Their history includes an Irish commission, the Grand Tour, and Rome’s flourishing artistic community at the centre of it all. Venus Italica and Hebe, from the Workshop of Antonio Canova were carved around 1820 during Canova’s lifetime, circa 1820. 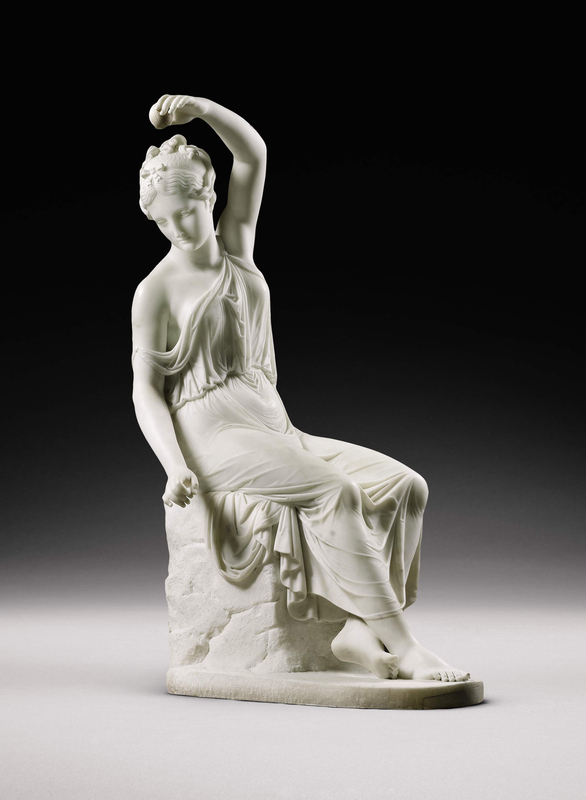 Estimated at £60,000-80,000, the marble statues were taken from two of Canova’s most famous models. When Sotheby’s Sculpture specialist Erik Bijzet first cast his eye over photographs of the sculptures brought to Sotheby’s Dublin office, he was immediately struck by their intrinsic quality and importance. UPDATE: Die Spinnerin made £241,250, Venus Italica and Hebe were withdrawn when they failed to reach their reserves. Tony O'Malley's Summer made 41,000 at de Veres. (click on image to enlarge). 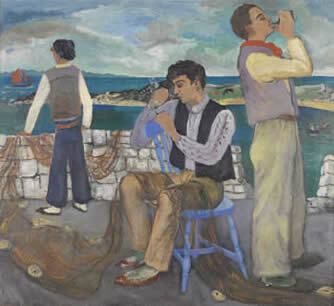 IRISH artist Tony O’Malley (1913-2003) is at last beginning to make waves in the salesrooms. He has long been admired by collectors and been the subject of important shows in major galleries like the IMMA, which mounted a retrospective, and the Crawford. At the time of his death he was considered to be the grand old man of Irish art. He was the subject of a show at Tate St. Ives, where he lived and worked for 30 years, in 2006. Yet at a series of Irish Sales over the years at Christie’s and Sotheby’s this artist did not achieve the sort of saleroom recognition that ought to have been his due. That is starting to change, and not before time. At de Veres in Dublin on Tuesday, June 15 three works by O’Malley were hotly contested. 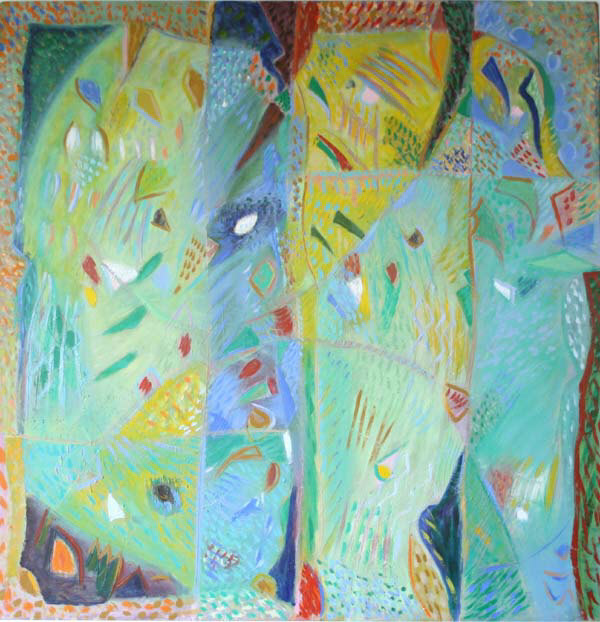 Winter, Summer and Spring are three oils on board, each one measures 48″ x 48″ and all are all dated to 1985. Four telephone bidders and three bidders in the room vied for them. Spring, the first to be sold made 38,000, Summer made 41,000 and Winter made 44,000. The top lot was Paul Henry’s Dingle Peninsula from Rossbeigh Beach. It made 46,000 in a sale which brought in a hammer price of just over 400,000 and achieved a sell rate of around 90 per cent. Conor Fallon’s steel Heron made 5,200 and John Behan’s bronze Famine Ship made 5,000. On the morning gallops by Peter Curling is estimated at 20,000-30,000 at de Veres in Dublin on Tuesday, June 15. UPDATE: It failed to find a buyer in an otherwise successful sale. 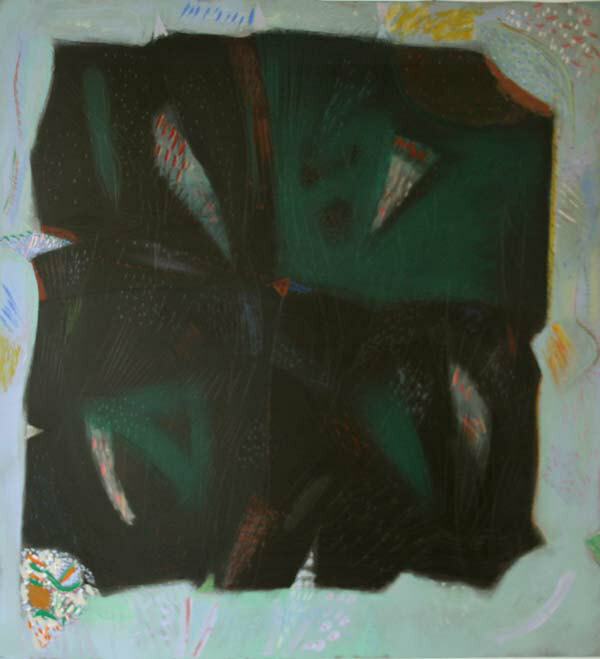 De Veres will offer a selection of leading Irish artists among 227 lots at their sale in Dublin on Tuesday, June 15 at 6 p.m. There are important works by Gerard Dillon, Peter Curling and Tony O’Malley leading a sale in which the top lot is a Kerry landscape by Paul Henry estimated at up to 60,000. Many works are more affordable than this. If recent auctions are anything to go by serious collectors will be out in force. Viewing at the D4 Hotel is on Sunday June 13 from 11 a.m. to 5 p.m., from 9 a.m. to 8 p.m. on Monday, June 14 and from 9 a.m to 3 p.m. on the day of the auction. An eyewitness account of the Battle of the Boyne sold at Bonham’s book sale on June 8 for £43,200. 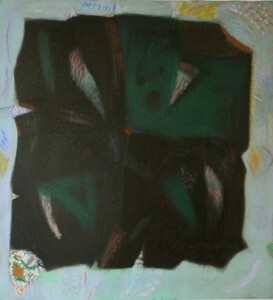 It had been estimated at £10,000 – 15,000 but attracted fierce bidding. The author, Captain John Stevens, tells of the chaos caused by the drunkenness of King James’s troops at the crucial moments before battle was joined, something that tended to be overlooked by 19th century historians. It was sold to an unnamed buyer. 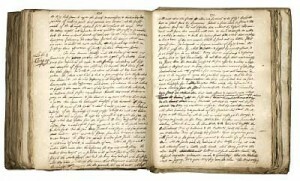 A specially bound first edition of James Joyce’s Ulysses made £22,800 against an estimate of £10,000-15,000 and the first edition in English of Isaac Newton’s Mathematical Principles of Natural Philosophy was sold for £28,000 (estimate £10,000 – 15,000). Some £500 million-worth of art is to be sold at auction in London’s biggest-ever season of sales in the last week of June 2010. An icon of Pop Art – Silver Liz by Andy Warhol (1928-1987) – will come up at Christie’s the Post-War and Contemporary Art evening auction on June 30. 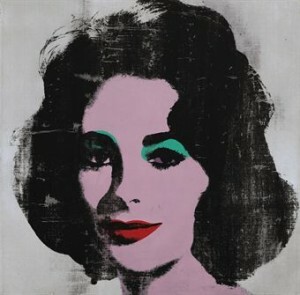 Painted in 1963 this rare portrait image of actress Elizabeth Taylor is expected to realise £6 million to £8 million. (It sold for £6,762,150). Sotheby’s expects to achieve more than £200 million from their series of sales. Highlights of their Impressionist and Modern art sales on June 22/23 include Edouard Manet’s Self Portrait with a Palette (£20-30 million), Derain’s Arbres à Collioure (see April 28 post on this blog) is estimated at £9-14 million and Henri Matisse’s Odalisques jouant aux dames (£10-15 million). Major School of London artists Lucian Freud, Leon Kossoff and Frank Auerbach will feature at Sotheby’s contemporary sales on June 28-29. Post war and contemporary artists on offer at Christie’s include Roy Lichtenstein, Andreas Gursky, Gerhard Richter, Jeff Koons, Alexander Calder, Jean-Michel Basquiat and Alighiero Boetti. Three works by Alexander Calder (1898-1976) include Two Fish Tales, 1975, expected to realise £1.2 million to £1.8 million. Christie’s will offer an exceptional water-lily painting by Claude Monet (1840-1926) at the Impressionist and Modern Art Evening Sale in London on June 23. Nymphéas, 1906, was included in the artist’s historic exhibition of the water-lily series in Paris in 1909 and remained in the ownership of the celebrated Durand-Ruel art dealing family for a number of following decades. Offered at auction from a private collection, it is expected to realise £30 million to £40 million. (This painting turned out to be the biggest casualty of the sales as it failed to find a buyer and was said to have been over estimated. Despite this the sale set a new record for a London auction at £153 million). ‘Silver Liz’ is on display in the exhibition ‘Andy Warhol. The Early Sixties’ at the Kunstmuseum in Basel, Switzerland to January 23, 2011. 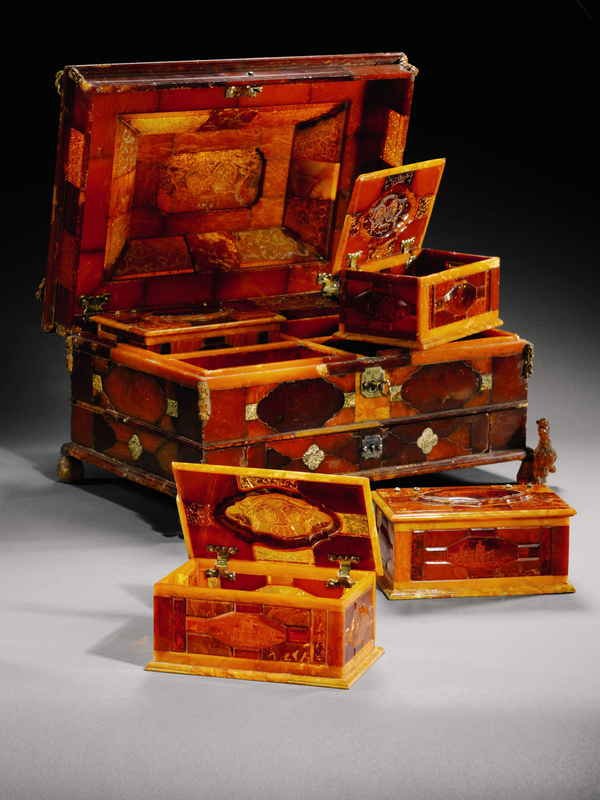 North German amber box made 627,250 at Sotheby;s in London on July 6. (click on image to enlarge). This North German amber casket bearing the arms of Prince William IV of Orange and Anne, Princess Royal of Great Britain, probably made in Danzig around 1734 goes on sale at Sotheby’s in London on July 6. Prince William IV of Orange (1711-1751) was a son of Johan Willem Friso, Prince of Orange, who stood to inherit the Principality of Orange under the terms of the will of William of Orange (1650-1702), popularly known as King Billy in parts of this country. He had no children. The beautifully crafted box was probably made to celebrate the union of Prince William IV of Orange and Anne, Princess Royal, the eldest daughter of King George II of Great Britain. Their marriage at St James’ Palace in 1734 enhanced the strong ties between Great Britain and the Netherlands. The amber from which the casket is made would have been dredged from the Baltic Sea, where it had been collected as fossilised resin from the forested land there over 100,000 years ago. Individual pieces are rarely over two inches long and this casket is made with hundreds of pieces. It is estimated to make £200,000-300,000. The casket is one of 21 works with exceptional provenance at Sotheby’s “Treasures” sale in July. The quality of each piece is matched by extraordinary provenance. The decorative art pieces in the sale, from porcelain to silver, snuff boxes, furniture and textiles, range in date from the 16th to the 18th century. Previous owners include Queen Marie Antoinette and the Medici Family. 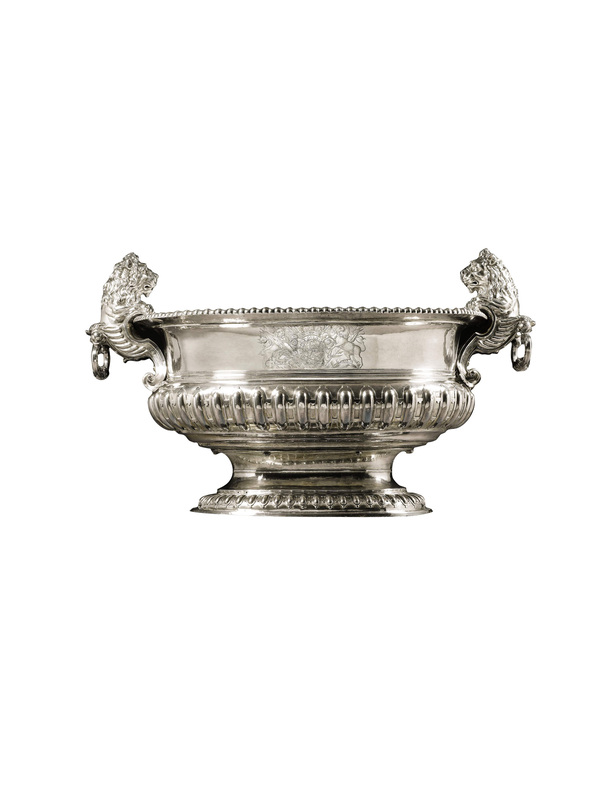 A monumental silver wine cooler weighing 168 pounds and measuring well over a meter across is reckoned by Sotheby’s to be the most important piece of English silver to come to the market in 50 years. It was made for Lord Raby when he was appointed Ambassador Extraordinary to Berlin in 1706 by Queen Anne. It is estimated to sell for £1.5 – 2.5 million, the highest estimate for any piece of English silver. This monumental silver wine cooler made a record 2,2505,250 at Sotheby's on July 6. (click on image to enlarge). An Italian engraved ivory inlaid rosewood centre table made for the Duke of Urbino Francesco Maria II Della Rovere (1549-1631), c 1596-7, and subsequently part of the collection of the Medici family is estimated at £500,000-1,000,000. There is a set of three parcel gilt stools made for Queen Marie Antoinette’s Salon des Jeux at the Châteaux of Compiègne and Fontainbleau, Louis XVI, circa 1786-87 by Jean-Baptiste-Claude Séné (1748-1803). They are estimated at £150,000-250,000. The pieces in this sale have been associated with names like Marie Antoinette, the Dukes of Devonshire, the Rothschild family, the Imperial family of Russia, the Princes Carafa of Roccella, the Duke of Urbino, the Medici family and the Earls of Macclesfield, Strafford and Dartmouth. What they share is a freshness to the market. THE Adams Bonhams sale of important Irish art in Dublin on June 2, 2010 brought in 1.5 million euro with 75 per cent of 168 lots sold. The top lot was Gerard Dillon’s Mending Nets which made 80,000. Next was Lavery’s portrait of Mrs. Arthur Franklin which brought in 75,000, followed by Colin Middleton’s Esmerelda, which made 62,000, a Yeats oil on panel entitled Dusty Lane, Kerry (1913) which made 50,000 and a watercolour entitled Procession by le Brocquy which sold for 46,000. 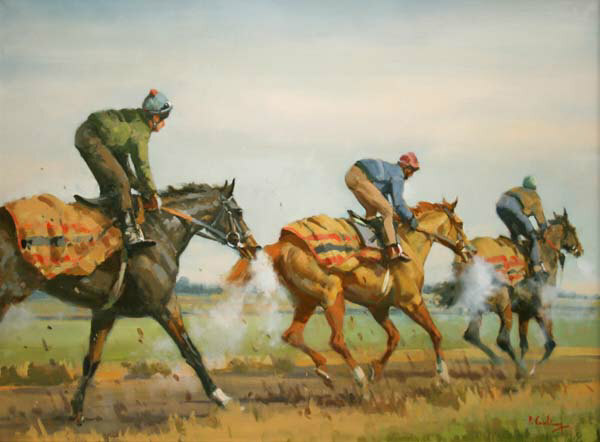 There were top prices too for Paul Henry whose Evening in Connemara made 45,000, Middleton’s Ecstatic Figure, Largymore made 40,000, as did Walter Osborne’s A Glade in Phoenix Park, William Conor’s The Street Dance made 38,000, Basil Blackshaw’s Fighting Cockerel made 32,000, Middleton’s The Sister Voice made 30,000 and so did Sean Keating’s Segregation, 1972.